Demanding and difficult, sometimes beautiful, sturdily important, this intense chamber orchestra reveals both personal and national anguish of Vietnam era. Launching its twelfth season with a revival of its 2010 production of Tom Cipullo’s widely acclaimed Glory Denied, Chelsea Opera made clear once again the reasons for which it has become and continues to be a leader among small regional opera companies here in the Northeast: presenting a varied and ambitious repertoire, it maintains consistently high standards of both music and theatrical direction. Both the fine complex score of Glory Denied and the first rate musicianship of the singers and instrumentalists who performed it were enhanced by the staging and direction of the company’s co-founder and co-executive producer Lynne Hayden-Findlay. 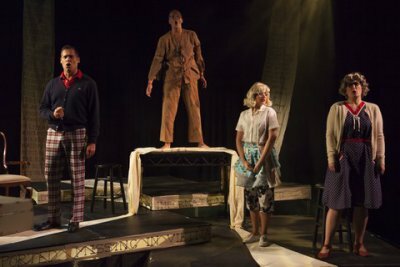 Based on the true story of America’s longest-held prisoner of war, Army Col. Floyd “Jim” Thompson, as told by writer Tom Philpott, Cipullo’s opera tells several stories simultaneously. 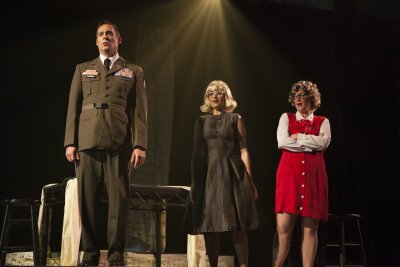 In a non-linear narrative, maintained by means of two couples – Younger Thomson and Alyce, and Older Thompson and Alyce – Cipullo manages to present the optimism of a young American marriage in the late 1950’s and early 1960’s, the terrible erosion of hope and spirit over the course of the Vietnam war for both the nation and one military couple, and a final personal descent into the bitter dark of purposelessness. Always skilled at crafting close and effective relationships between words and music, Cipullo used only Thompson and Alyce’s words for his libretto, creating a direct and unmediated entrance into the stories and psyches of Thompson and Alyce. The Younger and Older couples – the only singers – sing in various combinations of duets, trios and quartets; each of the four also has several solos. They sing across time and situation; foreshadowing and remembrance, hope and disillusion are in constant competition and confusion. Cipullo’s music is difficult and angular; he elicits from every instrument its capacity to fight against what is tough, evoking the unhinging distresses of the Vietnam Era. But Cipullo can write tenderly, too – some of Younger Alyce’s music is genuinely sweet – and the piano-cello duet in the second act that marks the moment of Older Thompson’s debilitating stroke is a rich examination of loss, a rare wordless eloquence in a work of words. The ten-member Chelsea Opera Chamber Orchestra, led by guest conductor Carmine Aufiero, once Chelsea Opera’s music director, played Cipullo’s demanding music marvelously, managing treacherous rhythms and harmonic shifts with apparent ease, and always alert to the singers on stage. And the singers were wonderful. Three were returning to their Glory Denied roles from the Chelsea Opera 2010 production: soprano Martha Guth/Older Alyce, soprano Kate Oberjat/Younger Alyce and tenor Brandon Snook/Younger Thompson sang with baritone Peter Kendall Clark/Older Thompson as though the quartet had been together for years. In each of the four, acting skills matched elegant musicianship. Both sopranos were effortless in the wide range from very low notes to very high ones, revealing not musical effort but the soul-bared emotions of their stories; both managed to “age” dramatically even within the context of their chronological stations as “Younger” and “Older” Alyce. Each individual of the singer-pairs – the Alyces and the Thompsons – had a distinctive voice-character, but the skill of Cipullo’s musical writing on the one hand and of the singers on the other made both the continuity of Alyce and Thompson and the profound changes within them credible. For many in the audience, as was evident in conversations before and after the performance and during the intermission, this performance was the second or third (or fourth or fifth) viewing of Glory Denied. Familiarity with the work no doubt made all the words intelligible. For those who were hearing the work for the first time, however, some of the words were hard to understand. It may be that at these moments, the words were repetitions … of words already understood … and were therefore simply voice sounds to be blended as instruments with the orchestra instruments, but this situation was sometimes frustrating. The staging of the opera enhanced its psychological progress and meanings. The four singers moved around the small stage in relationship to each other according to the needs and purposes of the music and the progress of the story: the blocking was smooth, clean and effective. The furniture and props were minimal and adaptable: chairs, bench, table, stools provided spaces as houses, church and prison torture holes. A trunk contained the indicators and ephemera of domestic and military history. At the black-curtain back of the stage, two swags of muslin hung from the top to the floor. Both were covered with painted words of sentence fragments. On one, the words were in the font of typed army correspondence – … “regret to inform” … – and on the other, the words were in the script of handwritten love letters. The set itself presented the narrative of Thompson’s nine years in captivity as a prisoner of war. The costumes were particularly fine. The men’s were straight-forward: they were mostly military and informal. The Alyces’ were inspired: the dresses were those of middle class women who struggled to be fashionable with both a limited budget and an equally limited sense of where modern liberation and conservative modesty might meet. This opera is important for several reasons. It is musically disciplined, innovative and coherent; it represents the best of contemporary American classical composition. It is a particularly lucid examination of one aspect of the complex, difficult Vietnam Era and its stories. It is also a piece that stands for all difficult war eras. But the strength of Glory Denied lies in the fact that it is not a conventional “anti-war” piece: such things now seem the product of the twentieth century, and of “simpler” wars, when anti-war sentiments had not progressed much beyond disagreement with the old claim, “dulci et decorum est pro patria mori.” Instead, Glory Denied is an immersion in absolute fracturing, an emotional and aesthetic surround-sound of assumptions unintelligibly upended, gods gone absent and shattered souls. 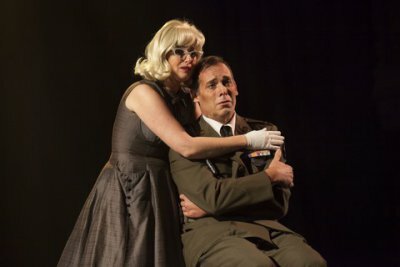 At this revival, American veterans were honored, as they had been in the November 2010 production. In addition, the Saturday, November 14 performance was dedicated to the victims of the terrorist attacks in Paris the day before. In this new era of terrorism, Cipullo’s musical description of personal, national and spiritual disorientation and dissonances in the Vietnam Era seems chillingly apt. Artists’ determination to continue to create – to write, compose, sing, play music and tell the truth – keeps us all strong no matter what the wars in which we find ourselves engaged. A robust and fine performance of the beloved Puccini masterpiece. A new opera, carved out of an epic, award-winning play, makes a valiant effort to condense a vast canvas into a focused drawing. An exhilarating double-bill of marvelously sung and beautifully presented one-act operas by contemporary American composer Henry Mollicone.